The “Kenosha” wood insulators are dated to the 1860's but a precise age has yet to be established. These specimens are extremely rare with only three known complete specimens. The two pieces in this photo were found in 1973 in a railroad depot in Kendalville, Indiana. The third specimen was found in an antique store in the Amana Colonies in Iowa just a few years ago. 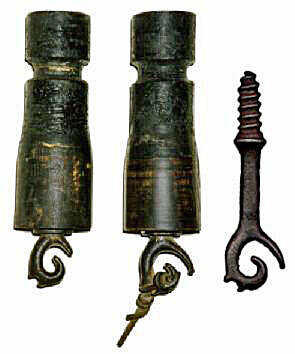 The threaded metal wire holder was found in Ohio and demonstrates how the “hook” appears when removed from the wood. “...made of wood, thoroughly baked, and covered with an INDESTRUCTIBLE COATING, highly repellent of moisture, which does not change nor deteriorate after years of exposure to the weather.